What does 'organic' mean when it is used on foods, like vegetables and fruit? Looking for What does 'organic' mean when it is used on foods, like vegetables and fruit? in 2019? Scroll down this page and follow the links. And if you bring home some fruit or vegetables and want to can, freeze, make jam, salsa or pickles, see this page for simple, reliable, illustrated canning, freezing or preserving directions. There are plenty of other related resources, click on the resources dropdown above. The steps to becoming a certified organic producer are very basic. The five that follow are typical, though variations might apply in different circumstances. The NSAIS has a complete description of what is involved in each step on this page. There is an exception for farms selling less than $5000 of produce annually, too. If you are interested in health, environmental health, and safety issues, see our sister site www.ehso.com , environmental health and safety online, for free information. Organic food is produced by farmers who avoid the use of bio-persistent nonselective chemical pesticides, fungicides and fertilizers. Farmers emphasize the use of renewable (or sustainable) resources and the conservation of soil and water to enhance environmental quality for future generations. The specifics vary depending upon the type of food and its method of production. For example, Organic meat, poultry, eggs, and dairy products come from animals that are given no antibiotics or growth hormones. Organic fruits and vegetables are grown without using most conventional pesticides, fertilizers made with synthetic ingredients or sewage sludge; bioengineer seed or plants; or ionizing radiation. Before a product can be labeled "organic," a Government-approved certifier inspects the farm where the food is grown to make sure the farmer is following all the rules necessary to meet USDA organic standards. Companies that handle or process organic food before it gets to your local supermarket or restaurant must be certified, too. What are some other differences between conventional farming and organic farming? Give animals antibiotics, growth hormones and medications to prevent disease and spur growth. Give animals organic feed and allow them access to the outdoors. Use preventive measures ; such as rotational grazing, a balanced diet and clean housing ; to help minimize disease. The USDA makes no claims that organically produced food is safer or more nutritious than conventionally produced food. Organic food differs from conventionally produced food in the way it is grown, handled, and processed. Some are considered "better", but for some foods it may not really make a difference (in terms of health benefits). An example of the latter is fruits with a thick inedible skin, like bananas or oranges. Studies show that pesticides applied do not enter the edible portions. And in processed foods studies again show that there is no measurable difference between organic and non-organic. For example, a jar of organic spaghetti sauce has the same nutritional value as the non-organic variety. The biggest difference come sin fresh and frozen unprocessed fruits and vegetables. In general, though, it is safe to safe that organic , and more particularly, "sustainably grown" foods are better overall, considering the nutritional value, absence of chemical residues, and less adverse affect upon the environment. You must look at package labels and watch for signs in the supermarket. Along with the national organic standards, USDA developed strict labeling rules to help consumers know the exact organic content of the food they buy. 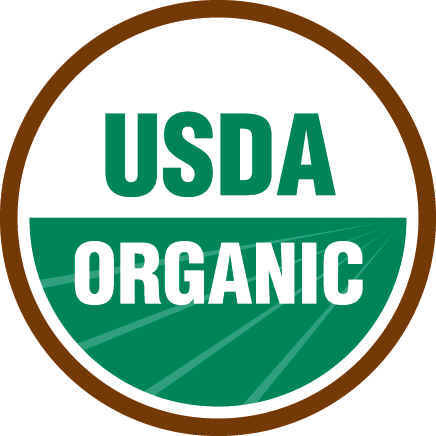 The USDA Organic seal also tells you that a product is at least 95 percent organic. Look for the word "organic" and a small sticker version of the USDA Organic seal on vegetables or pieces of fruit. Or they may appear on the sign above the organic produce display. The word "organic" and the seal may also appear on packages of meat, cartons of milk or eggs, cheese, and other single-ingredient foods. The following photo shows examples of the labels that may be used on a wide variety of products that use organic ingredients. Click photo of follow this link for larger image of cereal boxes. The sample cereal boxes show the four labeling categories. From left: cereal with 100 percent organic ingredients; cereal with 95-100 percent organic ingredients; cereal made with at least 70 percent organic ingredients; and cereal with less than 70 percent organic ingredients. Products with less than 70 percent organic ingredients may list specific organically produced ingredients on the side panel of the package, but may not make any organic claims on the front of the package. Look for the name and address of the Government-approved certifier on all packaged products that contain at least 70 percent organic ingredients. Will I find the USDA Organic seal on all 100 percent organic products, or products with at least 95 percent organic ingredients? No. The use of the seal is voluntary. How is use of the USDA Organic seal protected? People who sell or label a product "organic" when they know it does not meet USDA standards can be fined up to $10,000 for each violation. No. Natural and organic are not interchangeable. Other truthful claims, such as free-range, hormone-free, and natural, can still appear on food labels. However, don't confuse these terms with "organic." Only food labeled "organic" has been certified as meeting USDA organic standards. For more detailed information on the USDA organic standards, visit the USDA Nationa Organic Program website or call the National Organic Program at 202-720-3252, or write USDA-AMS-TM-NOP, Room 4008 S. Bldg., Ag Stop 0268, 1400 Independence, SW, Washington, DC 20250. These requirements do not preempt Food and Drug Administration; USDA, Food Safety and Inspection Service; or the Bureau of Alcohol, Tobacco, and Firearms labeling regulations or label approval requirements. Your product: Must contain 100 percent organically produced ingredients, not counting added water and salt. Your label MUST: Show an ingredient statement when the product consists of more than one ingredient. 1 To identify an ingredient as organically produced, in the ingredients statement, use the word, "organic" in conjunction with the name of the ingredient, or an asterisk or other reference mark which is defined below the ingredient statement. Your product: Must contain at least 95% organic ingredients, not counting added water and salt. other substances allowed by 7 CFR 205.605. Your label MUST: Show an ingredient statement. Your product: Must contain at least 70% organic ingredients, not counting added water and salt. Must not contain added sulfites; except that, wine may contain added sulfur dioxide in accordance with 7 CFR 205.605.
other substances, including yeast, allowed by 7 CFR 205.605. May contain less than 70% organic ingredients, not counting added water and salt. Show an ingredient statement when the word organic is used. Your label MUST NOT show: Any other reference to organic contents.